Volunteers pictured from front left are Nicole Evans with Morgan Evans, 2; Emily Zancofsky; Ed Valentine; Cliff Hutton; Stacei Faust; and Jerry Homick. From back left are Lynn Zancofsky; Ashley Smith with Cayse Smith, 4; Mason Evans, 4; Peyton Faust, 5; Kyle Faust; Molly Evans, 6; Ann McCole; John Bondura; and Chad Weaver. Not pictured, but present, was Tony Mione, President, Schuylkill Trout Unlimited. 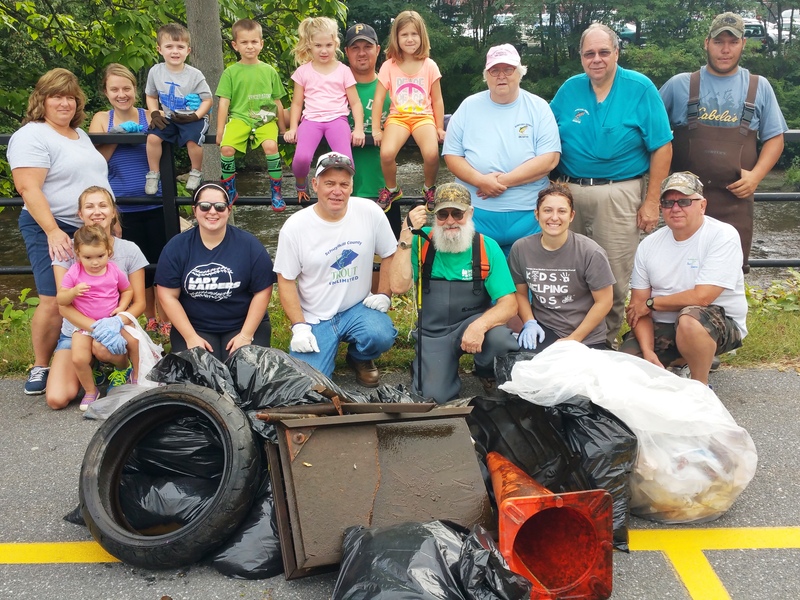 Tamaqua residents (and sisters) Stacei Faust, a 2003 Tamaqua graduate, and Emily Zancofsky, a 2012 Tamaqua graduate, organized their 2nd Annual Little Schuylkill River Cleanup yesterday (Saturday, September 5, 2015) along the river banks (next to Boyer’s Food Market) in Tamaqua. Zancofsky credited Faust’s 4-year old daughter, Peyton Faust, for coming up with the idea. Schuylkill Trout Unlimited members also helped in the cleanup. Boyer’s Food Market donated garbage bags and other supplies. Faust and Zancofsky stated their appreciation to all the volunteers who showed up to help, and to the Tamaqua Borough for their support.